I am a cookie freak. But the weird thing is, I never bake Christmas cookies. In December I’m always too busy making rich, indulgent desserts and elaborate menu plans to even think about baking cookies. And the traditional Christmas cookies with frosting and colored sugars just aren’t favorites of mine. For me, cookies are all about the everyday experience – the bite size, perfect small portion sweet. Cookies, happily, and unlike potato chips, don’t cause me too lose all self-control. Eat just one or two, and you’ve got dessert, guilt free. Or maybe just thing to get you through a long afternoon, with that last cup of coffee. So now, in January, while everyone else is glad to see the bottom of their cookie jars, and swearing off all baking for a few months, I’m back at it. It’s been really cold here the last week or two, but bright and sunny; the kind of weather that compels you to get outside, no matter what the temperature, so I was looking for a cookie with inherent warmth – something with all the flavors of real gingerbread. I ended up adapting Maida Heatter’s Sour-Cream Ginger Cookies. 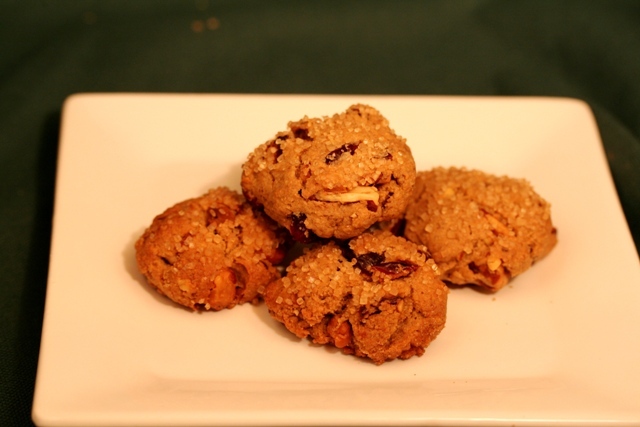 These cookies aren’t too sweet, but they have the flavor base I was looking for, with just enough bite to make them go perfectly with coffee or tea. The original recipe calls for a white glaze, which would have ruined it for me, but my version, which includes dried cranberries and walnuts, was just the thing after Mishka and I got back from our very cold run this morning. I learned a few cookie baking secrets during the two years I worked for a bakery and I employ them almost every time I make cookies . Always chill your dough. Don’t preheat the oven as every recipe directs in the first step. 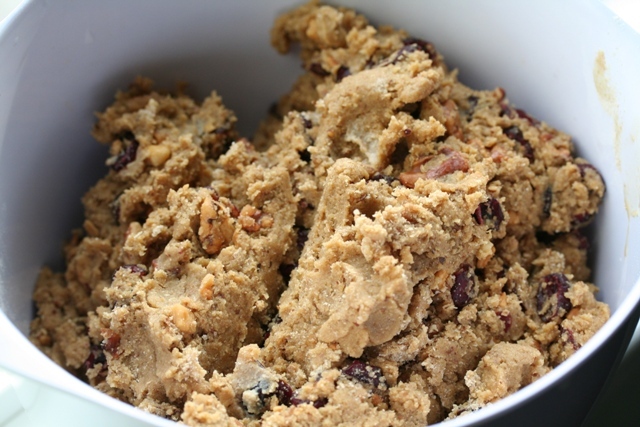 Mix up the dough, and put it in the refrigerator for at least an hour – preferably for a few. This makes a huge difference for every drop cookie recipe. You want the dough to be stiff enough that you can form a proper cookie – otherwise, you’ll end up with a thin lace-style cookie half the time. And finally, rotate your cookie sheets halfway through the baking time, even if you have, as we did in the bakery, a convection oven. Your cookies will be evenly browned every time. 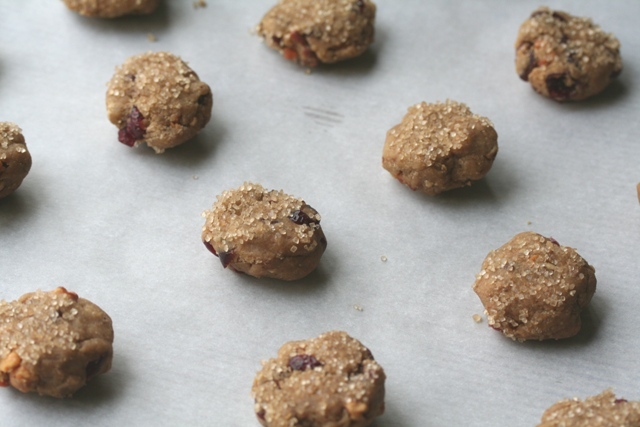 Here’s my recipe for Cranberry Pecan Ginger Cookies. Let me know if you give it a try. Wonderful cookies. And the second ones are with almonds? Nice blog and mission. I like this clean lay-out; it’s a nice format for featuring the food! I recently tried to clean up my blog, but everyone else’s still looks so much neater than mine.. Anyway, I like the idea of every day cookies. Thanks for the kind words – I’m still struggling with how I want my blog to look too. What a lovely story about your cookie lady. I’m off to visit your site. I wish I had a good answer for you. The bakery I worked at was decidedly artesian – everything, even much of the mixing done by hand, without machines. Some of the cookies – gingersnaps and chocolate-chocolate chip had that crackle, and some did not – oatmeal. I can tell you that we had commercial convection ovens, and always baked the cookies at a higher temperature (390) for the first ten min., and then flipped the trays and reduced the heat to 350 to finish most batters, but I don’t think that’s exactly the answer you are looking for. At home, I usually only get crackle on cookies that have sugar sprinkled on top, for what little that’s worth.